Knitting Club (Senior Center Program) (1:00 – 2:00 pm) @ The Southborough Senior Center, 9 Cordaville Rd: Bi-weekly gathering coordinated by Helen Varney. Come join a wonderful group of ladies working on their own creations and discussing community projects. Stop by for a cup of coffee/tea and visit with the group or join right in! For details, contact the Senior Center at 508-229-4453. BWALT Presentation (1:30 – 2:30 pm) @ Southborough Senior Center, 9 Cordaville Road: A presentation on the Boston Worcester Air Line Trail – looking at the multi-use rail trail’s past, present and potential future. For details, see dedicated post. Parenting Children with Mental Health Challenges (7:00 pm) @ Northborough Library, 34 Main St, Northborough: A parent talk sponsored by NSPAC. Meet Deborah Vlock, author of “Parenting Children with Mental Health Challenges: A Guide to Life with Emotionally Complex Kids.” For details, see dedicated post. Drama Out of the Box (4:00 – 4:45 pm) @ Southborough Library: Meredith Charles will help children explore the world of acting through pantomime, story-telling and creative expression. This program is for children ages 6 and up. Registration is required. Please register for this program at the circulation desk or by calling the library. This program is sponsored by the Friends of the Southborough Library. For details, see dedicated post. Downtown Initiative forum (7:00 pm) @ Town House Hearing Room: The Economic Development Committee will highlight recommendations from the Urban Land Institute’s report on its study of Main Street. The EDC will present its plans for 2019 with a focus on open public discussion and Q&A from residents and businesses. For details, see dedicated post. The Status of our Bumblebees (7:00 – 8:00 pm) @ Southborough Library: Join Dr. Robert Gegear as he presents information about our declining species of bumblebees, including results of research from 4 years of surveys at Breakneck Hill Conservation Land. Learn what you can do in your own yard to help species from going extinct. Find out how you can become involved in his citizen science project Beecology. Hosted by the Open Space Preservation Commission as part of our NATIVE POLLINATOR • NATIVE PLANT Initiative. For details, see dedicated post. Kids’ Night Out (6:00 – 8:30 pm) @ St. Mark’s Episcopal Church, parish hall, 27 Main Street : For children age 3 to grade 5. Guests will get to decorate their own pizza, watch a movie, make valentines and enjoy some fun games. The event is a fundraiser for the youth group’s summer mission trip. For details, see dedicated post. Beauty and the Beast (7:00 pm) @ Trottier Middle School auditorium: Neary School’s winter musical run by SkyRise Theater. This performance is by the “Wednesday cast”. For details, see dedicated post. Library Valentine’s Party (10:30 am – 1:00 pm) @ Southborough Library: The annual Valentine’s party for kids. 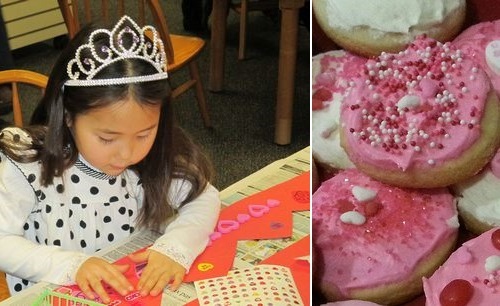 Join us for Valentine crafts, games and cookie decorating! Sponsored by The Friends of the Southborough Library. Valentine’s Day Luncheon (12:00 – 2:00 pm) @ : Annual free luncheon with Bingo for seniors hosted by Cub Scout Pack 926. Registration is required. For details, see dedicated post. Beauty and the Beast (2:00 pm) @ Trottier Middle School auditorium: Neary School’s winter musical run by SkyRise Theater. This performance is by the “Wednesday cast”. For details, see dedicated post. Finn Special Person Dance (3:00 – 5:00 pm) @ Finn School cafeteria: The Finn SOS fundraiser is a dance for Finn students and a parent/special adult in their lives. Registration was due Friday, January 25th. If you have questions, email mannjohanna@gmail.com or pamlopic@yahoo.com. For details, see page 3 of Finn’s Thursday packet. (afternoon session – 4:30 – 6:00 pm) This session is recommended for kids 6 and under. (evening session – 6:30 – 8:00 pm) This session is recommended for kids ages 7-12+. Beauty and the Beast (7:00 pm) @ Trottier Middle School auditorium: Neary School’s winter musical run by SkyRise Theater. This performance is by the “Friday cast”. For details, see dedicated post. Shir Joy Chorus Winter Concert (7:30 pm) @ Congregation B’nai Shalom, 117 E. Main St., Westborough: Shir Joy Chorus will present “Building Bridges Through Song” This concert of Jewish music is aimed at uniting and healing the community through song. For details, see website. Beauty and the Beast (2:00 pm) @ Trottier Middle School auditorium: Neary School’s winter musical run by SkyRise Theater. This performance is by the “Friday cast”. For details, see dedicated post. Masterworks for Solo Piano (3:30 pm) @ St. Mark’s School, Putnam Family Arts Center, Class of ’45 Hall: Pianist Ilya Kazantsev will perform Frederic Chopin’s 24 Preludes, Op. 28 Sergei Rachmaninov’s Etudes-Tableaux, Op. 39 For details, see dedicated post.